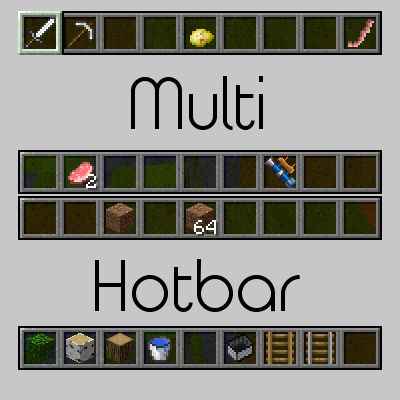 Multi Hotbar Mod 1.12.2/1.11.2 is a Minecraft mod that adds into the game an incredibly useful yet simple feature, which is to create additional Hot Bars for the player to add items, very convenient to use in many cases. Imagine you are a builder who has a great idea and should be carried out immediately, but the original Minecraft Hot Bar only has 9 slots, not enough to contain all construction materials. Players who are passionate about pixel arts will also have a problem that hot bar‘s capacity is limited but there are dozens of color blocks to use. To solve the problem of storage for the items, the creator of the mod has researched and introduced additional Hot bars to complement the existing one of the game, bringing the maximum number of hot bars up to 4. Use button (‘) to toggle between bars. You can download the latest version of Multi Hotbar mod from the link below and follow the instruction to install. Remember to check if the mod needs any additional mod to run. Happy gaming! Download Forge Installer, Multi-Hotbar.jar file.